Elsie K. Bellach passed away on Tuesday, Oct. 10, 2017. The family will receive loved ones on Sunday, Oct. 15, 2017, from 2 to 4 and 7 to 9 p.m., at Cherubini McInerney Funeral Home. The funeral service will be at Our Savior Lutheran Church on Monday, Oct. 16, 2017, at 11 a.m. Burial to follow at Oceanview Cemetery. Elsie was born and raised in Staten Island, N.Y., where she attended P.S. 30 and Port Richmond High School. She worked as a bookkeeper in the 1950’s in Manhattan, and as general manager in the 1980’s at Victory Lanes, Showplace, Rab’s Bowling on the Green, and Sunset Lanes. In 1990 she retired from bowling to be the business director at Lydia’s School of Dance. A lifetime bowler, Elsie became a certified coach instructor in the 1980’s and was the founder of Solberg Memorial Jr. Bowlers. She was awarded the Frank Bower Coach Award and was a 1980’s Coach of the Year. 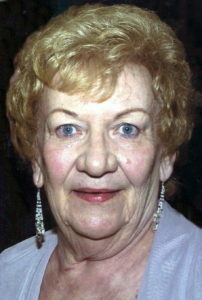 She was inducted into the Staten Island Bowling Hall of Fame in 2007. In her spare time, Elsie was a home care provider for the elderly and enjoyed gardening. She was a lifelong cat lover and a passionate Yankees fan. Elsie was a 15-year ovarian cancer survivor and had hopes and dreams of one day starting a senior citizen wellness center. She was the daughter of the late Walter and Alma Solberg. She is survived by her husband of 53 years, William L. Bellach; son, William Bellach; daughter, Lydia Bellach Ruocco; son-in-law Anthony Ruocco; grandchildren, Anthony Ruocco and Julia “Rosebud” Ruocco; niece, Kathleen Muller, and many more nieces and nephews. My deepest condolences to my cousin Sonny and his family. Elsie was known in the family as a sweetheart. My mom Dotty and dad Dominic thought she was elegant and sweet. May she RIP.